Cynthia: [to Bob] I no like you anyway. You got little ding-a-ling. Published by PolyGram International Publishing Inc. and Perren-Vibes Music Inc.
Q: Who plays the drag queen during the closing credits? 1994 proved to be rather a good year for Australian movies, with both this and MURIEL'S WEDDING delighting international audiences with their cheeky over-the-top humour, panache, pathos, winning performances, and fun soundtracks. Both, of course, heavily featured the music of ABBA (Australia has long had a particular love-affair with the Scandinavian quartet - it was probably no coincidence that it was decided to shoot the group's own feature, ABBA: THE MOVIE, during the Australian leg of their 1977 world concert tour). In MURIEL'S WEDDING the band's music is perhaps treated with more reverence and respect - Muriel Heslop is, after all, a huge fan, and the film itself is of a far more serious, distinctly black nature. 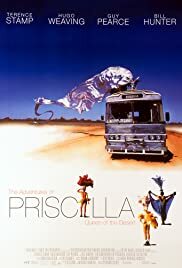 PRISCILLA, on the other hand, constantly revels in its own bitchiness and catty humour, and has countless memorable, and in many cases unprintable, lines of dialogue, including stabs at the supergroup - "I've said it once and I'll say it again - no more f***ing ABBA"; "What are you telling me - this is an ABBA turd?" Of course ABBA is merely one of MANY verbal targets for the film's three main protagonists, but far from this alienating us from any of them, we cannot help but be swept along by the sheer garish joy of the entire venture. The basic plot focuses on recently bereaved transsexual Bernadette (a magnificent, hardly recognizable Terence Stamp), who teams up with two younger drag artistes, sensitive Tick/Mitzi (Hugo Weaving) and screaming queen Adam/Felicia (Guy Pearce), so that they can travel half-way across Australia on board an all but dilapidated bus named "Priscilla", in order to perform a cabaret act at a remote casino run by an ex-partner of Tick's, soon revealed to be, horror of horrors, a WOMAN! Along the way they encounter all sorts of absurd situations and individuals almost as strange and unconventional as they themselves are, whilst Bernadette, against her better judgement, falls for gruff mechanic Bob (Bill Hunter, who also features in MURIEL'S WEDDING) that they pick up en route, and in so doing he loses his "mail-order" bride Cynthia (Julia Cortez), who in one especially memorable scene does things with ping-pong balls you just don't want to imagine! The performances are really the thing here - Terence Stamp (who won numerous accolades for his cast-against-type labours) is amazing and totally credible as the quietly dignified transsexual, and it is hard to believe that Weaving and (especially) Pearce have not worked as flamboyant, lip-synching drag queens all their professional lives! The gaudy, outrageous costumes won a well-deserved Oscar, and the photography of the barren, surreal landscape is also masterful, as is Stephan Elliott's creative direction and hilarious, ultimately poignant script. The soundtrack may not be to everyone's taste, but it has enough camp classics to satisfy anyone yearning to relive the tacky heyday of the '70s - including ABBA's "Mamma Mia", the Village People's "Go West", and Gloria Gaynor's superb "I Will Survive", given a gloriously inventive rendition to a bunch of appreciative aboriginals, with one of their number joining in most enthusiastically. A true kitsch classic, then - well worth re-visiting, again and again ... and again.